Barcelona are reportedly ready to sell Ivan Rakitic next summer in a bid to make room for the transfer of Manchester United midfielder Paul Pogba, or two other targets. Don Balon claim the Catalan giants looked close to letting Rakitic move to Paris Saint-Germain this year, but their asking price of €100million was too high, while it’s suggested other big names at the Nou Camp did not want to see the Croatia international sold. 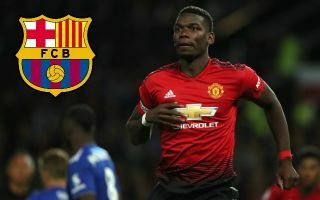 One more year of Rakitic could be a sensible strategy by Barcelona before recruiting a new, younger midfield player, with Pogba among three big-name targets for Barca. Don Balon also list PSG’s Adrien Rabiot and Ajax starlet Frenkie De Jong as options in the middle of the park. This could be worrying news for United fans regarding one of their biggest names, though many will perhaps wonder if Pogba is really the right fit for them anyway. The France international has not been at his best since moving to Old Trafford and seems to be on a different wavelength from manager Jose Mourinho. The 25-year-old perhaps doesn’t have the physicality or work rate for English football and both sides might do best by letting him go in the near future if there’s no improvement. United fans, which midfielder would make the best replacement for Paul Pogba? No one - we can NOT sell him!